I can't remember the last time I watched a G-rated movie. I'm just not interested in the kind of stories that appeal to children. They're too unrealistic for me, too excessively positive. The kind of movie I usually enjoy has to do with the challenges, the dramas and the truth of reality. For example, No Country for Old Men (2007) is a favorite of mine. I could name a hundred others like it. Usually not the kind of thing you'd want a kid to watch. If I had noticed that Hachi: A Dog's Tale (2009) was rated G, I probably wouldn't have watched it. But the Netflix system that matches my tastes with available movies rated it very high. And it starred Richard Gere, Joan Allen, and Jason Alexander. In my opinion, Joan Allen is one of the best actresses working now. I loved her in Georgia O'Keeffe (2009), The Upside of Anger (2005), and the Bourne thrillers. So I put it at the top of my queue. 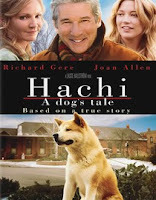 Based on the story of a real dog, the movie is about Hachi, a dog that is shipped from Japan and accidentally released at a train station somewhere in New England, where it is found and adopted by a college professor. The two quickly bond with each other. After his master dies, the dog loyally returns to the train station every evening where he was once greeted by him. All I can say is, this is probably the best "dog movie" ever made. It's extremely well acted, well scripted and well paced. While much of the story is about the feelings and behavior of the dog, it was plausible, not idealized. The emotions it evokes are earned and powerful. Given that dogs aren't really actors, the movie is amazing. I, a connoisseur of reality, was fully engaged and touched by the story. I've always said we could learn a lot about personal strength from animals. From Hachi we learn something about loyalty. I usually start to look at a G rated film by its actors! Thank you for reminding me to watch this movie. Every time I saw a preview I was captivated. It also reminds me of a fabulous book that I just read - The Art of Racing in the Rain, by Garth Stein. In case you don't know about it, it's a story about the trials of a professional race-car driver, husband, and father seen through the eyes of his faithful companion, a dog. As with Hachi, it seems, it is a touching, insightful book about the power of belief, faith, persistence, love, passion and devotion.